Foam Ear Plugs in Cases for our Best Pricing! Corded Foam Ear Plugs in Cases for our Best Pricing! How do I choose the right foam ear plug for me? Each person's ears and ear canals are totally unique, as individual as fingerprints. As a result, there is simply no better option than trial and error to determine which ear plugs will work best for you. But finding the right ear plugs is not as hard as it sounds. Most foam ear plugs are designed to fit and work well for most people. 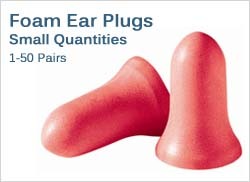 As a rule of thumb, a good pair of foam ear plugs will completely fill your ear canal for a good seal against noise; the ear plugs will fit comfortably, and will not cause pain or discomfort; and the ear plugs will provide enough protection (the higher the NRR, the more protection you get) for the noise levels in your environment. 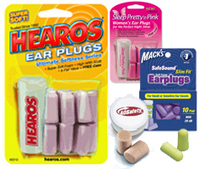 If you have no experience with foam ear plugs, we highly recommend our ear plug assortment packs -- these allow you to easily (and inexpensively) try many kinds of foam ear plugs to find the perfect plugs for your unique ears. How do I insert foam ear plugs? How do I know if I'm wearing them properly? Foam ear plugs absolutely must be inserted and worn properly, or you will not get the full benefit of the ear plug's NRR (Noise Reduction Rating). To learn how to insert and wear your foam ear plugs for the best results, check out this quick video: "How to Properly Fit a Foam Ear Plug." The video is only two and a half minutes long, and it does a superb job of explaining exactly how to insert your foam ear plugs properly for a safe, comfortable, and effective fit. What's the difference between foam ear plugs and consumer foam ear plugs? In a nutshell, the difference is the packaging. Most foam ear plugs are also known as industrial foam ear plugs. These ear plugs typically come in boxes of 100-200 pairs, and each pair of ear plugs is wrapped in an individual plastic poly-bag. We break bulk, making a wide selection of industrial foam ear plugs available to you in convenient quantities -- so you can buy as little as a single pair of industrial foam ear plugs. By contrast, consumer foam ear plugs tend to come in retail blister packs of one or more pairs, sometimes with extras like a free carry-case. Aside from the packaging, industrial foam ear plugs and consumer foam ear plugs are the same (of course, different foam ear plugs are available in each category). Whether the ear plugs are classified as regular foam ear plugs or consumer foam ear plugs will not affect the way the ear plugs work or how effective they are. We recommend that you choose your foam ear plugs based on NRR, material (softer foam vs PVC foam), size, and any other factors that may be important to you, such as color. 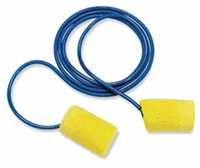 What is a corded foam ear plug? Each pair of corded foam ear plugs features a cord that connects each pair of ear plugs, keeping them together. This allows you to hang your ear plugs around your neck after you take them out, which is perfect for situations in which you may need to remove and re-insert your ear plugs many times over the course of a day. The cord helps to keep your ear plugs from getting lost, and can also help prevent you from accidentally dropping them on the ground or floor, forcing you to go get a new pair of plugs (you never want to put dirty ear plugs in your ears!). Are there other types of foam ear plugs? Absolutely! 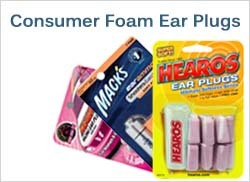 Foam ear plugs are the most popular and widely-used hearing protector available, and they come in many different types. In addition to foam ear plugs, corded foam ear plugs, and consumer foam ear plugs, you can also get metal detectable foam ear plugs, which are most often used to comply with food industry regulations, and no-roll foam ear plugs, which are foam ear plugs with a stem. The stem allows you to insert and remove the ear plugs very easily, without needing to roll the ear plugs down for insertion -- a necessary step for inserting other foam ear plugs -- hence the "no-roll" name. For individuals or small organizations who need just a few pairs of uncorded foam ear plugs, you have the right department. 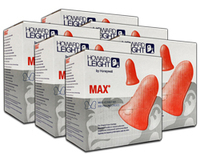 We carry a tremendous selection of ear plugs at some of the best prices you can get anywhere. When you need ear plugs daily for personal use, or when your business or organization needs a moderate quantity of ear plugs, boxes are the best choice. 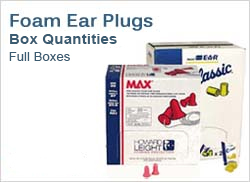 Here you will find full boxes of each of our extensive selection of uncorded foam ear plugs. 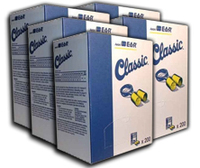 Here you will find our extensive selection of industrial disposable foam earplugs. Choose uncorded disposable foam ear plugs in case quantities for our very best pricing. 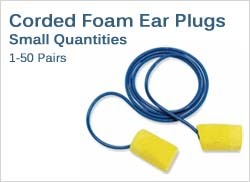 For individuals or small organizations who need just a few pairs of corded foam ear plugs, you have the right department. 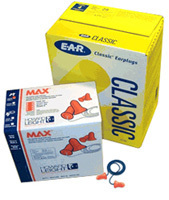 We carry a tremendous selection of foam ear plugs at some of the best prices you can get anywhere. 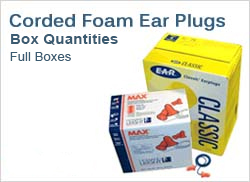 We carry a huge selection of corded foam ear plugs, available by the pair, in boxes, or in cases. Here you will find full boxes of uncorded foam ear plugs, which are ideal for frequent personal use, small businesses, and small organizations. 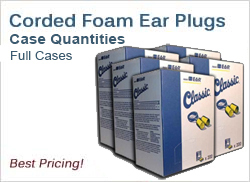 If you need one or more full cases of corded foam ear plugs and our best prices, you have the right department. 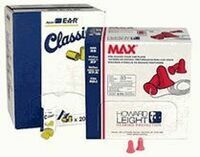 We carry a tremendous selection of foam ear plugs at some of the best prices you can get anywhere. 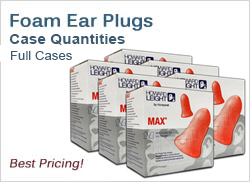 Shop for full cases to get our deepest discounts on corded foam ear plugs. 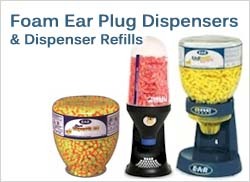 These dispensers and refill packs are used to deliver popular E-A-R, Peltor, Moldex, Elvex, or Radians ear plugs, easily and hygienically, one ear plug at a time, right into your hand. Ideal for industrial work areas and workshops! Ear plug dispensers can be refilled with hygienically-sealed refill bottles, bags or boxes of bulk unwrapped ear plugs, making them easy to use, easy to replace, green and cost-effective.